Keith and his wife Val’s path in life changed five years previously when Keith was offered a work assignment in Switzerland. The experience opened their eyes to new opportunities and so back in America they took the bull by the horns and became self-employed. This brave move enabled them to take their destiny in their own hands and gave them the freedom to split their time between America and France. 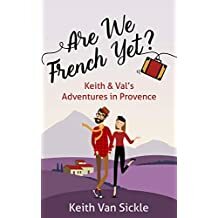 Finally, back in their beloved Provence, complete with their dog of course, Keith and Val settle into their rented property and become reacquainted with the area and their French friends. They are keen to learn conversation French so they take lessons with a teacher called Geneviève who takes no prisoners where pronunciation and attention to details are concerned. Throughout this informative story the open and helpful characters of the French people they meet and befriend shine through, and also the completely different attitudes of the French and Americans to things in life. Perhaps to everyone the most obvious is the pace of life in each country, and this is something which you immediately notice whether you are an expat or you are just on holiday. However, as you spend more time here you can’t fail to notice the French peoples attitude to work and family life are so different. The author’s wonderfully descriptive writing brings alive the warmth, culture, food and wine enthused life in Provence, with meals out with friends, visits to vineyards, and of course the marvellous scenery. On this visit amongst other things we find out what it is like to go gluten free in France, discover the French reaction to the Eurovision Song Contest, and experience the famous Courses de Camarguaise. To be able to live in two totally different countries must be a wonderful experience, and I thoroughly enjoyed this opportunity to savour Provencal life, and meet through his writing some of its people. However, there is one thing which anybody new to France is in peril of getting wrong and that is the kiss, or is it kisses you give and receive when greeting, and also how many? Not to mention the worry of which side of the cheek you start on. Fear not, the answer to these questions and many more are weaved within the pages of this thoroughly entertaining book which I highly recommend to anyone who wants to relax and enjoy France from the comfort of their armchair. 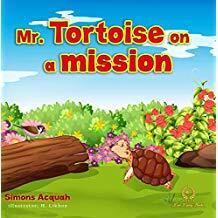 The author Simons Acquah was originally from Ghana and now lives in North Beach, Maryland. He is passionate about promoting reading, and supporting children’s literature, and works with several non-profit organisations to help achieve this. This desire to help build children’s characters through his wonderful stories shines through from the first page of this lovely story which I downloaded to read to my granddaughter. Then, desperate for food she asks the other forest animals and birds for help, but only one would help her, the tortoise. Because of his kindness she survives the drought, however, despite her promise she has no intention of repaying Mr. Tortoise’s kindness, and he is very unhappy when he discovers that he has been tricked. What was the good advice, and what happened next? Well, to discover the answer to these questions and more you will have to read this wonderful heart-warming story yourself. My granddaughter and I loved this enchanting yet educational story which has been beautifully illustrated by H. Likhon. 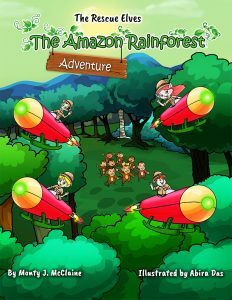 The illustrator brings the authors wonderful forest creatures to life, and we are looking forward to reading more books in this lovely series.